The story revolves around an actual incident that occurred on December 7, 1941. An aircrew is ferrying an unarmed Boeing B-17 Flying Fortress heavy bomber named the Mary-Ann across the Pacific to the United States Army Air Corps base at Hickam Field when they fly right into the middle of the Japanese air attack on Pearl Harbor and the beginning of America's direct involvement in World War II. An uncredited William Faulkner wrote the emotional deathbed scene for Ridgely, who played the pilot of the Mary-Ann. On December 6, 1941, at Hamilton Field, near San Francisco, a United States Army Air Corps B-17D bomber named the Mary-Ann and its crew are being readied for a flight across the Pacific. Master Sergeant Robbie White (Harry Carey), the Mary-Ann's crew chief, is a long-time veteran in the Army Air Corps, whose son, Danny White is a West Point graduate, an officer, and a pilot. The navigator, Lt. Monk Hauser Jr. (Charles Drake), is the son of a World War I hero of the Lafayette Escadrille. The pilot is Michael Aloysius "Irish" Quincannon Sr. (John Ridgely), the co-pilot is Bill Williams (Gig Young) and the bombardier, Tom McMartin (Arthur Kennedy). Sergeant Joe Winocki (John Garfield) is a disgruntled gunner who, as an aviation cadet in 1938, washed out of flight school after he was involved in a mid-air collision in which another cadet was killed. Quincannon was the flight instructor who requested that the board of inquiry dismiss Winocki. The navigator and bombardier also washed out of pilot training. With the United States at peace, the Mary-Ann and the rest of its squadron are ordered to fly without ammunition to Hickam Field at Pearl Harbor, Territory of Hawaii. As it happens, the Mary-Ann flies right into the Japanese sneak attack on Pearl Harbor on December 7, 1941. [Note 2] In its aftermath, the beleaguered B-17 crew is taxed to the limit, as they are ordered on, with little rest, first to Wake Island, and then on to Clark Field in the Philippines, both locations also coming under heavy Japanese attack. While en route, the crew listens to President Franklin D. Roosevelt ask Congress for a declaration of war. They take along two passengers to Clark Field: fighter pilot Lt. Thomas "Tex" Rader (James Brown) and a small dog, "Tripoli", the Marines' mascot on Wake Island. When they land at Clark Field, White learns that his son was killed on the first day trying to lead his squadron into the air. Soon after, Quincannon volunteers his bomber for a one-aircraft mission against a Japanese invasion fleet, but the Mary-Ann is attacked by enemy fighters and forced to abort. The badly wounded Quincannon orders his men to bail out, then blacks out. Seeing this, Winocki remains aboard and the crippled Mary-Ann makes a successful belly landing, being unable to lower the landing gear. Having told a dying Quincannon that the Mary-Ann is ready to fly, the crew works feverishly through the night to repair their bomber using parts salvaged from other, damaged B-17s, as the Japanese Army closes in. Private Chester volunteers to fly as gunner in a two-seat fighter aircraft defending Clark Field. In aerial combat, the pilot is killed, so Chester bails out; he is shot repeatedly and killed by a Japanese fighter pilot while descending helpless in his parachute. Winocki and White shoot down the fighter. When the armed Japanese pilot stumbles from the burning wreckage, a furious Winocki machine-guns him repeatedly. The exhausted aircrew barely manages to finish their repairs as the airfield comes under heavy ground attack. With help from the Marines and Army soldiers, the Mary-Ann, now returning fire, roars down the runway and flies again. As their B-17 heads for Australia, with Rader as the reluctant pilot and the wounded Williams as co-pilot, they spot a large Japanese naval invasion task force below. The crew radios the enemy's position and circles until reinforcements arrive; the Mary-Ann then leads the bombing attack that destroys the Japanese fleet (the missions portrayed in these Coral Sea sequences mirror real-life events). In the final scene, a bombing attack on Tokyo is finally announced to a roomful of bomber crews, among them several familiar faces from the Mary-Ann, including Rader, now a B-17 pilot. As their bombers take off, President Roosevelt's words are heard in a stirring voice-over, while the assembled air armada heads towards the rising sun and victory. Boeing B-17D Mary-Ann as seen in the film. Director Howard Hawks credited the concept of the film to Lt. Gen. Henry H. Arnold, Commanding General of the Army Air Forces, based on the experiences of a flight of B-17s that left Hamilton Field, California, on the night of December 6, 1941, and literally flew into the war the next morning at Pearl Harbor. Executive producer Jack Warner was adamant that the film be ready for release by December 7, 1942, the first anniversary of the attack on Pearl Harbor. To that end, miniatures for battle sequences were filmed in May and June 1942, before completion of the script and storyline. Although pre-production work on Air Force had already taken place, the official start of the production on May 18, 1942, was tied to the War Department approving the script. Development of the film was concurrent with script-writing by Dudley Nichols, with some characters based on Air Corps personnel Hawks met while traveling to Washington, D.C., to confer with Arnold and the War Department Motion Picture Board of Review. Nichols's script, submitted June 15, was 207 pages in length (twice that of the normal feature-length film), had its initial 55 pages devoted to "character development," and was not finished. Principal photography for Air Force, consisting of aerial shots and exteriors, took place at Hendricks Army Airfield, Florida. For water scenes and shooting miniatures shots, MacDill Field, Florida, Randolph Field, Texas, and Santa Monica Bay, California, were used. Shooting began June 18, 1942, using a rented mock-up of a B-17 interior, in which the 10 principal characters performed for a month. The company then moved by train to Drew Army Air Field, Florida, at the end of July, to spend the next month shooting aerial sequences coordinated by Paul Mantz, chief pilot and aerial technical coordinator [Note 3] for the production. Drew was selected because of fears that use of aircraft marked as Japanese might cause panic on the West Coast. At the end of August, Hawks returned to Hollywood and engaged William Faulkner to rewrite two scenes for Air Force, including the death of the Mary-Ann's pilot. By then, the film, scheduled to be completed by September 17, was three weeks behind schedule and only half completed. Production featured a celebrated clash between producer Hall Wallis and Hawks over the latter's constant changing of dialogue as scenes were shot. Hawks was briefly replaced on October 4 by Vincent Sherman, but returned from "illness" on October 10 to take back primary direction. Sherman remained as second unit director to assist with completion of the picture, which wrapped on October 26, 1942, failing to shoot 43 pages of script and 33 days over schedule, too late to meet its December 7 release date. Ten Boeing B-17B/C/D Flying Fortresses were from Hendricks Army Airfield at Sebring, Florida. The majority were B-17Bs upgraded to B-17C/D standards, as was the B-17 that portrayed Mary-Ann. The bomber's on-screen, "wartime security" serial number 5564 (actually "40-5564") is listed in the film credits, but the bomber's actual serial number was 8584 ("38-8584"), being so marked on the left side of the vertical tail. The 05564 serial number actually belonged to a North American AT-6 Texan trainer. In the film's beginning stock footage flight ĺine scene, an early model YB-17 can be seen in the background of the bomber lineup on the flight line. North American AT-6 Texans and Republic P-43 Lancers were painted as Japanese fighters. Bell P-39 Airacobras and Curtiss P-40C Warhawks were the AAF fighters; they were from Drew Army Airfield, Florida. Six Martin B-26C Marauders were painted as Japanese bombers; they were from MacDill Field. The basic premise of Air Force, that a flight of B-17s flying to reinforce the defense of the Philippines flies into the attack on Pearl Harbor, reflects actual events. From that point on, however, all of the incidents are fictitious. No B-17 reinforcements reached the Philippines; the survivors of those already based there retreated to Australia less than two weeks after the war began. The major bombing mission depicted at the film's climax most closely resembles the Battle of the Coral Sea five months later. Miniature shooting for its battle scenes was filmed in May and June 1942, concurrent but probably coincidental with Coral Sea and the Battle of Midway. Anti-Japanese propaganda in the film included scenes in which the crew is forced to land on Maui Island and is shot at by "local Japanese," and the assertion by the Hickam Field commander that vegetable trucks knocked off the tails of parked P-40 fighters as the attack began. Also, Lt. Rader claims a Japanese blocked the road in front of him, as he hurried to the airfield, and then shot at him with a shotgun. As detailed in Walter Lord's book Day of Infamy, later investigations proved no Japanese-American was involved in any sabotage during the Pearl Harbor attack. There are several scenes in Air Force showing a tail gun position on the Mary-Ann. The bomber in the film is playing the part of a Boeing B-17D; no early B-17s, series A to D, were fitted with machine gun positions in their tails. Tail machine guns were not added by Boeing to the early B-17s until the company rolled out their redesigned B-17E model. However, in the film, the crew of the Mary-Ann are shown making a field modification to their bomber's rear fuselage: They remove the tail cone and leave the tail wheel extended in flight to allow for the installation of a single, improvised, machine gun position, "a stinger in our tail" as one crewman calls it. Some air crews did install a broomstick painted black in that clear plastic tail cone to help ward off enemy fighter attacks from the rear. As detailed in the book Swoose, a few B-17 crews installed a remotely-controlled (via a cord) .30 caliber machine gun. Critical acclaim followed the film's premiere as Air Force echoed some of the emotional issues that underlay the American public psyche at the time, including fears of Japanese Americans. In naming it one of the "Ten Best Films of 1943", Bosley Crowther of The New York Times characterized the film as "... continuously fascinating, frequently thrilling and occasionally exalting ...". When seen in a modern perspective, the emotional aspects of the film seem out of proportion, and although it has been wrongly dismissed as a piece of wartime propaganda, it still represents a classic war film that can be considered a historical document. 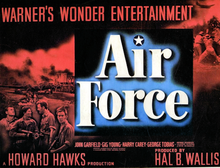 When initially released, Air Force was one of the top three films in commercial revenue in 1943. Later reviews of Air Force noted that this was a prime example of Howard Hawks's abilities; "Air Force is a model of fresh, energetic, studio-era filmmaking". Air Force placed third (behind The Ox-Bow Incident and Watch on the Rhine) as the best film of 1943 by the National Board of Review of Motion Pictures. Air Force editor George Amy won the 1944 Academy Award for Best Film Editing, defeating Casablanca, For Whom the Bell Tolls, Five Graves to Cairo, and The Song of Bernadette. Dudley Nichols was nominated for Best Writing, Original Screenplay; Hans F. Koenekamp, Rex Wimpy, and Nathan Levinson for Best Effects, Special Effects; and Elmer Dyer, James Wong Howe and Charles A. Marshall for Best Cinematography, Black-and-White. Air Force was presented on Lux Radio Theatre July 12, 1943. The adaptation starred Harry Carey and George Raft. ^ The finale of the movie features a patriotic statement on screen indicating victory is still to be won followed by the standard World War II motion pictures ending: a request for the theater audience to buy War Bonds. ^ This is based on a true incident. ^ The aerial technical coordinator was typically considered the "air boss." Besides flying, Mantz operated as a third director or assistant director on the staged aerial sequences. ^ Wheless rose to the rank of lieutenant general and was Assistant Vice Chief of Staff of the Air Force at the time of his retirement in 1968. ^ Stills from the film have indicated that B-17B 38-269 may have actually played Mary-Ann. ^ a b c d e f Orriss 1984, p. 67. ^ "Credits: Air Force (1943)." IMDb. Retrieved: June 24, 2011. ^ McCarthy 2000, pp. 336–337. ^ Orriss 1984, p. 68. ^ Orriss 1984, p. 64. ^ McCarthy 2000, pp. 337–339. ^ McCarthy 2000, pp. 341–342. ^ Wallis, Hal B. and Charles Higham. Starmaker: The Autobiography of Hal Wallis. London: Macmillan Publishers, 1980. ISBN 0-02-623170-0. ^ Orriss 1984, p. 69. ^ a b "Tampa in the 1940s." tampapix.com.. Retrieved: July 25, 2011. ^ Crowther, Bosley. " 'Air Force' (1943)." The New York Times, February 4, 1943. ^ Macdonald, Daniel. "Air Force." DVD Verdict, August 31, 2007. ^ Anderson, Jeffrey M. "Wing Men." Combustible Celluloid, June 8, 2007. ^ "The 16th Academy Awards (1944) Nominees and Winners." oscars.org. Retrieved: June 22, 2013.